Batsickle Pickaxe in Fortnite BR. You can buy it from the Cash Store for 800 vbucks. Batsickle is the name of one of the Pickaxe Skins in Fortnite Battle Royale. "Take a crack at harvesting with the Batsickle. It's half bat. Half sickle. All Batsickle." 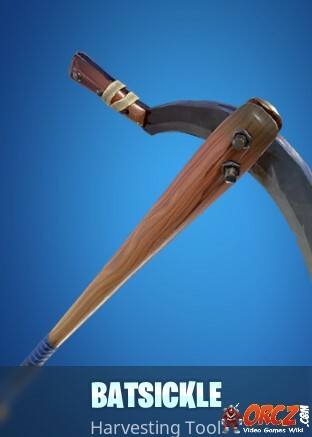 This item is a skin that modifies the look of your Pickaxe (Harvesting Tool). Buy it from the Cash Shop. Equip the Batsickle Harvesting Tool in the Locker before the match.